13 years ago my hubby and I got hitched. At the time I was just as in love with bright colors as I am now. How I wish I would have had a rainbow colored reception! But I was planning the wedding in the spring and pastels were abundant. I do not like pastels. But my brides maids, all dozen of them (okay, that is a small exaggeration) were in pastel dresses. That is really the only thing about the day I wish I could change. One thing that was completely amazing at my wedding was the food. All made by my family. If there is one thing my family does well at parties it is over feed people. So in addition to all the cake (and there was WAY too much cake) there were also other desserts, like cream puffs. So long story short, if I were to replay the day in my head, the cream puffs would have been dressed in rainbow colors too. 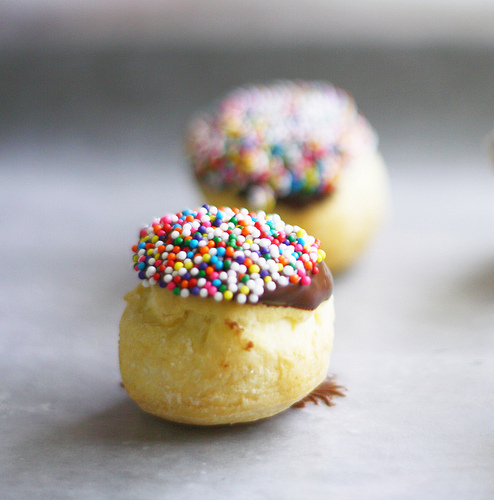 Like these cute puffs from The Fancy Bee. Actually if I had my way, I would probably cover a lot of things in nonpareils. It might be better that I don't get a redo! These are beautiful! My girls are in complete agreement with you ... rainbow anything is always the best. Sounds like a delicious way to end a wedding meal! I'm all for alternatives to wedding cake and love that you had cream puffs in addition! Sorry about your feelings towards the pastels! And thanks for linking to this recipe! I love nonperils and cream puffs so this recipe is just for me!